Suzi Nassif is famous for her impressive works of art including pop art portraits. Indeed she has created some marvelous works of art depicting some other artists who left a mark in the world. Well, she has done pop art paintings depicting pop icons such as Amy Winehouse, Mademe Marlene, and Lina in wonderland. In this article, we are going to talk more about the two famous stars in Suzi’s art. The two famous pop music stars here are the French rock king Johnny Hallyday and British rock star Freddie Mercury. Jean-Philipe Léo Smet popularly known by his stage name as Johnny Hallyday was a French rock n roll pop start who is credited for having brought the rock n roll type of music to France. He was born on the 15th of June 1943 in Glad, France. He later died on the 6th of December 2017 when aged 74 years. In his career that spanned a total of 57 years, he released 79 albums and even managed to sell records to the tune of 80 million worldwide. Most of his albums were sold to the French-speaking world for obvious reasons. He is just one of the famous stars that Suzi Nassif has featured in her great works of art. In her work of artwork where she has featured the French rock n roll star, she depicts him as a king putting a crown to his head. The work is an acrylic painting on the canvas where the French pop icon appears to be in a pensive mood. Two hands one to the left and another to the right of the portrait can clearly be seen holding the crown to the head of the rock n roll artist. To sample this work of art created by Suzi Nassif, kindly visit her official website page. Farrokh Bulsara who was commonly known as Freddie Mercury was a leading rock artist who was born in the East African island of Zanzibar in 1946. The star and his family moved to England from Zanzibar in 1964 following the outbreak of the Zanzibar Revolution. The star settled in Middlesex England where he studied music and also wrote a number of songs for many years before he, drummer Roger Taylor and guitarist Brian May formed a band commonly known as the Queen. He wrote numerous songs for the band and also was instrumental in the band’s success. Sadly he passed away in 1991 due to complications arising from AIDS. He is also one pop artist that Suzi Nassif has created in her popular works of art. 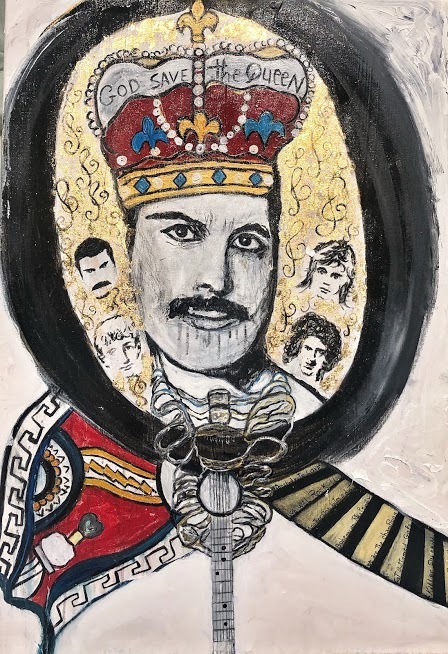 Suzi Nassif depicts Freddie Mercury as ‘God Saves the Queen’. In the portrait, Freddie is seen wearing a crown with inscribed words “God Saves the Queen”. Within the same portrait are other painted images of other people perhaps those who were members of his band. It is an amazing work of art Suzi Nassif has created, to sample it please visit her official website page.